ISO-NE on Friday rejected a request that it conduct an independent analysis on whether state renewable energy and carbon reduction policies are creating a need for additional transmission. The RTO acted in response to the Conservation Law Foundation’s May 16 letter asking it to conduct the analysis despite a May 1 submission by the New England States Committee on Electricity, which said there are no current transmission needs, although some could arise in the future. 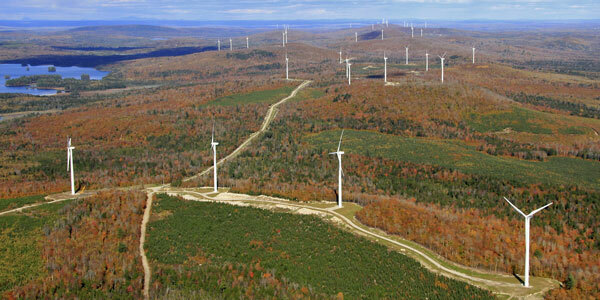 Rollins Wind Farm in Maine | Reed & Reed, Inc.
“The ISO disagrees with the conclusion reached in the May 16 CLF letter,” Theodore J. Paradise, ISO-NE assistant general counsel for operations and planning, said in a June 9 letter to CLF Senior Attorney David Ismay. “The Tariff is clear that while there is a process for stakeholders to request an ISO review of the NESCOE letter regarding federal public policies, there is not a similar review provision for state public policy determinations made by the New England states and communicated through NESCOE. Ismay told RTO Insider on Monday that CLF is considering filing a complaint with FERC in response to the RTO’s determination. It “is obvious to all in the region … that state public policies, particularly those of Connecticut, Rhode Island and Massachusetts, are driving the procurement of large volumes of renewable and other low-carbon generation that are directly impacting regional transmission,” he said. The Conservation Law Foundation asked ISO-NE to override its member states and conduct a study to determine transmission needs driven by state renewable energy and carbon reduction policies.